The 5th Philippine International Pyromusical Competition is an annual event of lights and colours that brightens the sky of Manila Bay, it opens every February in SM Mall of Asia in Pasay City. Each Saturday, two countries will showcase their spectacular firework displays accompanied by music using the theme of their choice. I was able to witness the third instalment of the competition wherein Japan and France showed their awesome and breathtaking pyromusical masterpieces. You should go and watch this event, it's worth the money and time. TIP: Get the P500 VIP ticket for a better view of Manila Bay and the firework exhibition. Be an hour or an hour 1/2 early at the venue to get the front seat spot. Food and beverages are available inside. Other ticket prices are P1500 (Patron with dinner), P300 (Gold) and P100 (Silver). You can by your tickets at the venue and around SM Mall of Asia during the event, you may also check Ticketnet and Ticketworld online. Other competing groups are Australia, Spain, United Kingdom, China, Germany, Finland, Canada and USA. 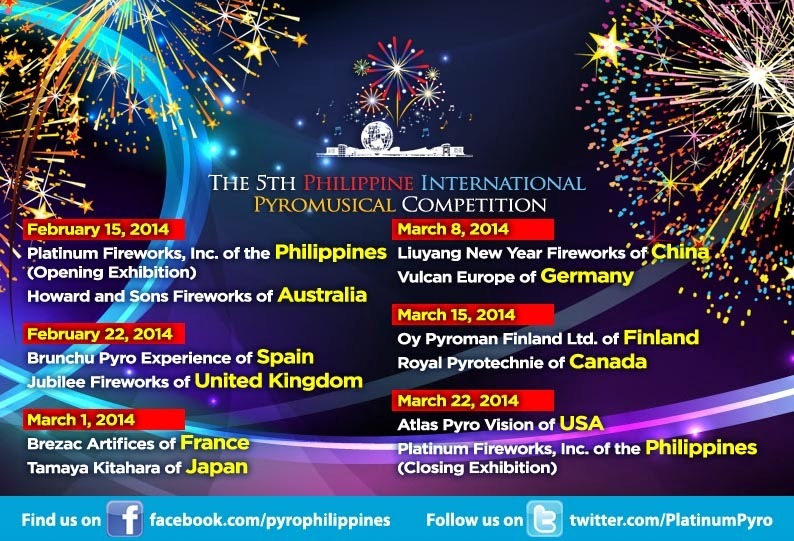 Platinum Fireworks of the Philippines is part of the opening and closing exhibition.